You’re probably reading this with the great expectation of finding out all I am capable of doing. No, I meant that title quite literally. I’m going to tell you why, despite Daxson’s insistence that I’ve lost all sanity when I do it, I can. I mean good, old-fashioned canning. You know, the kind with the water bath canner, the glass mason jars, the old screw top lids. Canning. The art of preserving food. I only usually do it once a year. Sometimes twice. It’s a big production. It takes up a good part of the day (okay, it takes up the whole day if you consider the number of times I stop to nurse the baby or change a diaper or attend to another need around the house or as was the case this year, to run to the grocery store to pick up any missing ingredients) and it takes over the kitchen completely (maybe next year, despite the chaos, I’ll remember to snap a few pictures during the process so you can see how much I am not kidding). It’s actually a little daunting. I wake up on the morning I’ve planned to can and I ask myself again if I’m sure I’m up for it. Usually I dread it a little. Now for those of you that don’t can, don’t get me wrong. 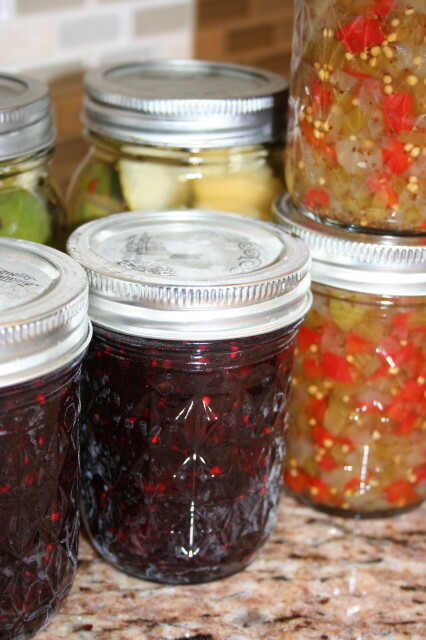 There is absolutely nothing difficult about canning. It’s just time consuming. Especially if you’re making something besides jam because usually there’s some prep work involved. This year my dear father-in-law sent over tons of cucumbers (strangely, he didn’t even plan to plant cucumbers…the seed packet was marked zucchini, but these are most definitely cucumbers). First, I decided to make a recipe called Cucumber Relish (which I now know is really another name for sweet pickle relish…good to know…I’m not really sure what I thought I was making but I didn’t think it was going to be sweet pickle relish since it was called cucumber relish). “Cucumber relish” requires lots of finely dicing and chopping ingredients. So here’s what my day looked like: Dice and chop. Dice and chop. Change a diaper. Dice and chop. Feed the baby. Dice and chop. Time for lunch. Dice and chop. Let it set for four hours. Four hours? That’s plenty of time to prepare some more things to can. Plus that only used four of the monster cucumbers (I still had ten left!) So I scrounged up some blackberries and made jam (yeah, I know, what does that have to do with all those cucumbers? Absolutely nothing. I just thought blackberry jam sounded delicious). Then I had to decide what to make with the leftover cucumbers. Dill relish. Quick trip to the grocery store for the missing ingredients only to return home and realize that it was going to take forever to prepare the ingredients since I have a teeny, tiny food processor. Decided to try making refrigerator dill pickles…much faster (although now I have another grocery trip in my future to return all the items for making dill relish). Pickles in the refrigerator. Time to can jam. Jam canned. Finish making cucumber relish. Can the relish. Done. By this point, my children had now been left to play on their own for the better part of the day, dinner was no where to be seen, and I was exhausted. Daxson wandered out into the kitchen, saw the mess, made a face, and asked me for the third time that day, “And tell me again, why do you can? You do realize you can buy all this same stuff at the store, right? Save yourself all the time and effort.” Usually I respond with a quick, “yeah, but homemade tastes better.” This time I was silent. In my exhausted state of being, I was wondering why do I can? Now 24 hours after the final top sealed and I’ve had time to think about it, I know why I can. Because there is a final product. Something to show for my hard work. Most things I do on a daily basis don’t have a final product. If I cook, it’s quickly consumed. If I make the beds, no one notices and within 12 hours, the beds are unmade once again. I do pile after pile of laundry and at the end of the day, there are more clothes in the hamper. Even my children are works in progress. Like the great cathedrals, I do not see a finished product. But canning? Well, canning gives me pretty jars to hold. Canning gives me a homemade gift to give to dear friends and family. The jars sit on the counter top (until we’re tired of staring at them) for all to see the great accomplishment of the day. 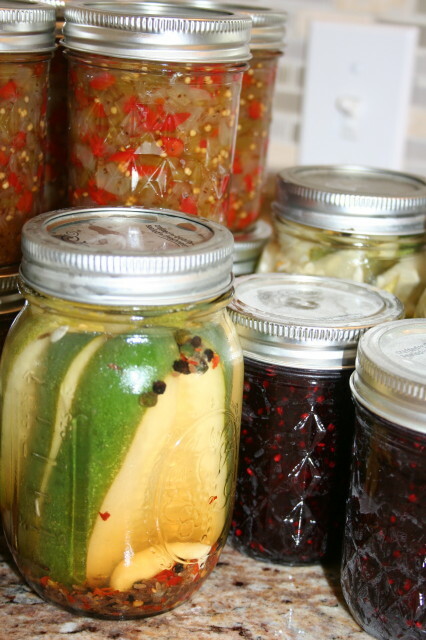 In a world of unfinished products, canning just feels good. Amy, you inspire me! You are exactly right…we are preserving a tradition that keeps us close to earth. I love feeling that despite the fact that I may have never met my great grandma, somehow I am connected to her through this art of preserving food. Plus it just tastes yummy!